Mardi Himal Trek is aggressively booming popular among outdoor and trekking passionate that offers some of most pleasant walk through beautiful hamlet, nature’s lush green dense forest, seasonal herder’s bamboo huts, and some of world best landscape view with giant Annapurna Himalaya range capturing images that displays the grandeur and beauty of nature. It is so amazing that when you watch sunset washing a mountain of fall foliage with a blaze of color and experience the river snaking majestically through eroded canyon walls, or a tree against the whispering grass and blue sky above towering high snow capped peaks, it’s the scale of nature that helps tell the story about the beauty of the outdoors. As there is poplar saying of Albert Einstein - “Look deep into nature, and then you will understand everything better” that could be Mardi Himal Trek’s best reward of your walk having opportunity of observing grandeur of a best scenery and nature beauty that make you forget all your fatigue and tiredness. Our dream trek to Mardi Himal could be one of the lifetime hiking experiences in Annapurna region of Nepal with carefully our designed itinerary and most competitive package cost. This exceptionally attractive Mardi Himal Trek to Base of Mt. Mardi (5547m) is close up to the virgin mountain of Machhapuchhre was first traveled around by a Swiss traveler and trekker during 1956 and later in 1980s few camping trekking groups hiked hardly ever but the area remained wilderness till 2012. Mardi Himal trek is very rich natural beauty, flora and fauna and offers breath stopping views over Himalaya and jaw dropping landscape scene. This awesome hike to Mardi is best thought of as a “Ridge-trail”! because most of the time you trek along the ridge beginning from Kande, one of the best starting points for this trek, situated 36 kms north of Pokhara. You have to follow this ridge west, until Mardi Himal Base Camp. Your trek begins from Kande at the height of 1770m above seas level and reaches 4500m at the end point, Mardi Himal Base Camp. We will walk through just a few villages in the beginning, and at the end of the trek some particularly beautiful villages. We will have to spend most of the time is pristine dense forest on this trek! This is a very quiet and peaceful. This fascinating trip is a combination, being both adventurous and peaceful and joyful nature environment. Above all, when you reach high camp at 3900m, or the upper view point at 4450m, the views are breathtaking: the snow- capped peaks include Annapurna I ,8091m, Annapurna South ,7219m, Himchuli ,6441m, Annapurna Fang (Baraha Shikher) ,7647m, Khangshar Kang (rock noir) ,7485m, Gangapurna ,7454m, Mardi Himal 5553m, Machhapuchhre’s (fish tail), both peaks (6997m – 6993m) and the beautiful sloping landscape to the south. This fantastic Mardi Himal Trek in Annapurna is perfect and wonderful for those who don’t like to walk where many other tourists are hiking. There are many confusing trails into the dense forest: everywhere you can see the small trails walked by yaks and sheep, which look similar to the main trail. A formally some years ago, The Mardi Himal Route was open for the trekkers, but you don’t feel it so when you are in the dense forest of it and some narrower paths above high camp! In our understanding there are many places along the trail need to fix and put more signposts, poles and metal bar etc. Firstly it was made for yak and their herders, sheep and their shepherds. Seasonally, lower villagers go up to the forest and up to the sloping grassy lands to take things like bamboo and dhakai, a kind of wild vegetable, wild mushroom and some Himalayan herbs and Yarsa Gumba (cordyceps sinensis) . Mardi Himal Trek is a beautiful, wild trek, into pure nature- a true gem of the Himalaya, a quiet and peaceful environment. It may be a bit daring but it is a more pleasant destination for those who like to be away from the hectic rush of civilization. Hiking through a pristine trail in the Annapurna foothills and dense forest. Day 01: Kathmandu to Pokhara. Day 08: Trek to Lumre and drive to Pokhara- 3 hours walking and 2 hours driving. Day 01 :Kathmandu to Pokhara. Day 01: Kathmandu to Pokhara, 200km, 7 hrs by car, 8 hrs by bus and 25 min. by flight. The tourist buses leave at 7:00AM from Kathmandu. Kathmandu to Pokhara distance is 200km drive that that takes 8+- hours depending on traffic on the way. Alternatively; we can arrange a flight ticket if you would like to take a scenic flight that cost USD 118 per person per flight in Buddha air. Also private car can be arranged on your request. Overnight in Pokhara in hotel Splendid View. Day 02 :Drive to Kande and trek to Pothana (1890m) After buffet breakfast in our hotel we leave for our trek. First, we drive from Pokhara to Kande by private car or van as per group size. We drive through small villages and houses; soon you will start our trek at Kande at the elevation of 177om. We ascend and enter the bushes and forests of rhododendron and red sandalwood with beautiful southern views. You will reach Australian Camp, a very beautiful little village. From there you can see the Annapurna mountain range, and a little of Manaslu and the Dhaulagiri range including Fishtail Mount and Pokhara valley in the south. There are good campsites and four nice lodges. It would be nice to sleep here, but for a first day the trek to Pathana (1890m) is also nice. Australian Camp is famous around Pokhara for a picnic spot with easy access and a beautiful mountain scene. This place is surrounded by red sandalwood and rhododendron forest. 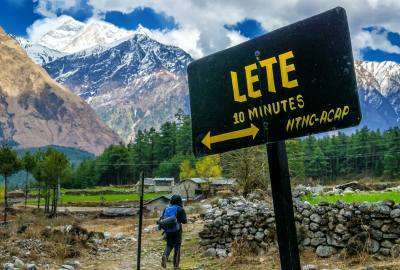 The trail begins through a beautiful and pleasant short descent in the red sandalwood forest, and then let’s says, “Nepali flat “to Pathana. Sometimes you will get to see few red/white NATT-signs. There is an ACAP permit check point + tourist information center as well. Day 03 :Trek to Forest Camp (Kokar) 2520m, Pathana to Pitam Deurali is a wonderful hike in the red sandalwood and rhododendron forest and with some little open land between, known as buffalo pasture. After some minutes on the flat there is a slow, gentle climb up and then a bit more uphill until the flat resting place at Pitam Deurali. In between you can see some ACAP signposts and our NATT- logo in red/white. If those signs are taken away, you have to follow the straight direction; do not turn either left or right. Now is the official start of the Mardi Himal Trek. Leaving behind the Trekkers Inn Lodge, there is an ACAP signpost saying Mardi Route (Forest Camp). We did paint on the pole of ACAP signpost and at the corner wall of this lodge; you also clearly see the steps on the wall between the signpost and the lodge’s, behind the side wall. When you go up the steps, you immediately turn to the right and go straight, entering the scrubby forest. Then you can follow the blue/white sign. Most of the time we painted on the tree barks as there were only a few opportunities to mark on rocks. You climb gently and in 15 – 20 minutes, you reach a little area of open land, which is buffalo pasture (you might not recognize it as a pasture for animals) where we made a larger mark on the rock in blue/white color. Coming to this pasture you might get a little confused but if you look carefully, there should be no problem finding it. After the pasture you enter a dense forest and you will gradually climb up (for 2 to 3 hrs). Then most of the time you hike on Nepali forest” flat “(a little up and down). Finally, after a short, gentle descent you reach the flat at Forest Camp. From some places between Pitam Deurali and Forest Camp, you will have the chance to see vistas of Dhaulagiri and the Manaslu range. If the weather is good , I suggest you to take a packed lunch or something to eat and plenty to drink as there are no lodges, restaurants, villages or water- only dense and very quiet forest. Between Pitam Deurali and Forest Camp there are more than two signposts showing directions to Lwang village on the other side. Do not turn left or right, just go straight, following the directions of the blue/white colored signs. This little village is surrounded by beautiful green forest. They have nice campsites as well. From here there is also a trail going down via Sidding, Lwang and Pokhara. On the western side you can see Ghandruk and surrounding villages and Modi valley. Stay overnight at Lodge. Day 04 :Trek to Low Camp (2970m) The trail goes through the courtyard of Hotel Forest Camp and Restaurant. At the corner wall of toilet we painted and put a little arrow. You follow the blue/white mark on the tree bark. The hike is an easy uphill start from right behind the Hotel Forest Camp. After 7 to 10 minutes, you will turn right and walk straight, going gently up and down. Finally you will climb up and you will reach Rest Camp. The trail starts from the end of the right corner of the tea house and soon you can see the blue/white marks on the tree bark. Most of the time it is a gradient ascent, after just a few meters , turn right and continue straight; there is some uphill and “Nepali flat” then later there are mostly gradual trails, ascending into the dense rhododendron forest. Before 15 – 20 minutes; you reach a flat trail; finally you’re at Low Camp. There are now four lodges with restaurants and similar menus to Forest Camp. This is a very beautiful place with a beautiful campsite as well. It is surrounded by a beautiful rhododendron forest, a very quiet and peaceful environment, with a view of Machhapuchre and Mardi Himal, when the weather is clear. Stay overnight at Lodge. Day 05 :Trek to High Camp (Kew) 3700m You still follow the blue/white sign, entering the scrubby rhododendron forest by a gentle ascent of 10 – 20 minutes, and then start going up the trail in the dense forest till reaching the lower viewpoint (3289m). This will take 1 ½ – 2.00 hrs. Now begins a grassy slope. From here you can also see many wonderful mountain views, especially at sunrise and sunset. Now, you continue further up to High Camp, hiking mostly on the grassy slope, up steep and some narrow paths and into some little rhododendron forests. Sometimes you may find difficulty in seeing our signs, because it was very difficult for us to find good rocks at the right distances. Sometimes we also had to use small rocks to paint on so when the grass grows higher those signs may be hidden. If the weather is good, this hike is also one of the nicest, because you have the chance to walk along the yak beaten trail on an open ridge with great mountain views: the Annapurna range , Machhapuchre,and the southern green landscape; below, can be seen the very deep Modi river valley, including Ghandruk, Chhomrong, Sinuwa and Dovan . This place itself is a natural viewpoint tower! In all directions you can see breathtaking views, including Machhapuchre, Mardi Himal, Annapurna I, Annapurna South, Baraha Shikhar, Himchuli and the southern slope including Pokhara valley! This place is also very suitable for yak and sheep-you can see many yaks around. Oh, Madhav Gautam, the yak herder, gave us fresh milk! Fantastic Himalayan milk!! There are a couple of yak shelters as well. Stay overnight at Lodge. Day 06 :Excursion Mardi Himal Base Camp (4500m) and trek to Middle Camp Today you should start earlier, but do not start in the dark if you don’t know the trail. You still see blue/white signals till Upper View point. After you have hiked 20 to 30 minutes, further on to the trekker’s paradise of High Camp, there is a trail junction at the bottom of a high hill. Though it seems the real trail goes directly up through the dangerous steep hill, (and yes, some crazy trekkers and local people would take it because of the shortcut), I would never recommend you to do so, for then you would put your life at risk! Immediately from this junction you can turn to the right and you should look for the blue/white marks on the rocks. I hope they will last, even though we were not able to find the most suitable and best rocks. When you have just turned right, as I said above, you will see a flat, wide place, looking like a little dried up pond and you should walk through it. Further along you can see more marks and then continue straight for 15 – 20 minutes. After that, turn left, going steeply upwards. In another 15 – 20 minutes, you will reach a little pasture, then turn towards the left hand side and trek continually and gradually up the grassy slopes. In 15 – 20 minutes, you will join the trail junction coming up through the dangerous path. Then you follow the blue/white marks, before reaching the Upper View Point; for some hundred meters the path is very narrow. When it is covered by snow, it will be especially difficult and slippery, because both sides are very steep and you hike just along the ridge. But if the weather is good, you get a great chance to view the Annapurna I 8091m, Annapurna south 7219m, Himchuli 6441m, Baraha Shikhar (Fang) 7647m, Tent peak 5695m, Singachuli 6501m, Gangapurna 7454m, Gandarvachuli 6248m, little summit of Annapurna III 7555m, both peaks of Machhapuchre (Mt. fishtail) 6993m – 9997m and Mardi Himal 5553m, MBC (Machhapuchre Base Camp), Deurali, Dovan, Sinuwa, Chhomrong, Ghandruk and the southern slope, including Pokhara valley and MHBCW (Mardi Himal Base Camp W) 4500m, to go from the upper view point Mardi Himal Base Camp will take about 30 minutes only. Coming down to High Camp Hotel would take some 4 hours maximum. Except for some hundred meters of narrow path, it is not that difficult, as long as there is no snow on the way. This day trip is quite adventurous, beautiful, joyful and definitely worth it. Stay overnight at Lodge. Day 07 :Trek to Siding village (1,700m) 6 Hours of walk takes us to Siding. On the return trek we take a different route so completing a circuit, from Low Camp there is a trail that goes down to Siding village rather than going back down Mardi Himal back to Kokar. Siding is a traditional Nepalese village and still very much away from the busier tourist treks and it is likely you will stay at a homestay in Siding owned by the person who runs one of the lodges at Low Camp. It is a wonderful cultural experience finding out more about village life and you will probably eat dhal baht in the evening with the family in their kitchen. Overnight at Homestay or Teahouse or Lodge. Day 08 :Trek to Lumre and drive to Pokhara- 3 hours walking and 2 hours driving. From Siding you walk out to the road head at Lumre, on the way from Siding you will pass the villages of Kalimati and Ghalel. Kalimati is mainly a Brahmin village with Ghalel and Siding mixed Brahmin and Gurung. At Lumre you will meet your jeep organized by us in advance to drive you back to Pokhara. Overnight at Hotel. Day 09 :Back to Kathmandu or extend your stay in Pokhara Your trip comes to the end with Wilderness Excursion. You have choices to extend your stay in Pokhara to relax here or drive to Chitwan National park for awesome jungle safari, from Pokhara you can also go to Lumbini – the birth place of Sakyamuni Buddha. The tourist bus ticket is included if you are coming back to Kathmandu. 2 Nights sharing twin/double deluxe room in 2 star hotel in Pokhara. 1 Sharing porter for 2 trekkers to carry your luggage. 1 Assistant guide if group size exceed more than 6 pax. Meal: 8 Breakfasts, 6 Lunches and 6 Dinners during the trek. Sharing twin/double bed room in tea house lodges during trek. Accommodation, food, salary, equipment for your guide and porters. Transfers by car/cab or jeep depending on group size to/from trekking. Meals in Pokhara excpet breakfast in the hotel. Guided and sightseeing and monuments entrance fees in Kathmandu and Pokhara. International tour leaders are encouraged to get discount and complimentary.